Taxis in Amsterdam and the rest of the Netherlands are generally quite expensive but can be useful to take on occasion – such as getting to the airport for early flights, taking luggage to and from the train station or during the night when public transport services are more limited. Taxis in Amsterdam are not normally hailed on the street as stopping is not allowed on many roads in the city centre. In Amsterdam you can either call a taxi company to come and pick you up or you can go to one of the many official taxi ranks around the city centre. There are taxi ranks (taxisstandplatsen) in the inner city centre at: Central Station (IJ waterfront side), Damrak, Nieuwezijds Voorburgwal, Nieuwmarkt, Rembrandtplein (Amstel), Spui, Waterlooplein and Westermarkt. Amstel Station, Apollolaan, Ceintuurbaan (Sarphatipark), Elandsgracht, Ferdinand Bol Straat, Frederiksplein, Haarlemerplein, De Lairessestraat (Museumplein), Leidseplein, Middenweg, Passenger Terminal Amsterdam, ‘s Gravesandeplein (Oosterpark), Tropenmuseum and Victorieplein. You can also find a few taxis waiting outside major hotels. Licensed taxis have a blue number plate and are usually black or metallic coloured saloon/station wagon cars. What this means is that journeys in the rush hour/heavy traffic will cost more than travelling in light traffic due to the time fare component. A short ride in town will cost around €10. 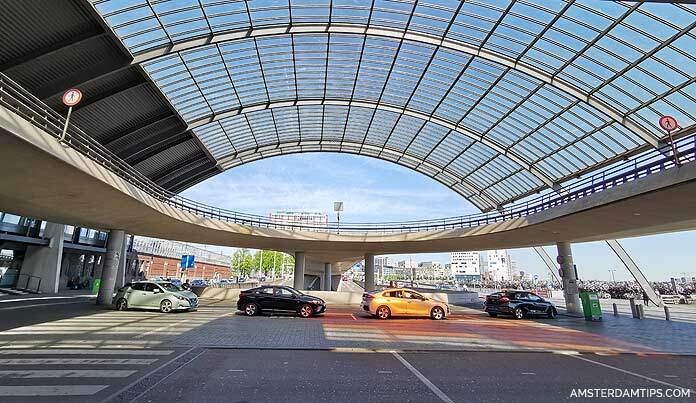 A trip from central station to the Amsterdam RAI convention centre should cost €15-20. A ride between Schiphol airport and the city centre should cost €45-€50. Amsterdam public transport tickets will certainly be cheaper than taking a taxi. Small ’rounding up’ tips are appreciated but not necessary. Note that longer journeys can sometimes be negotiated by a fixed fee rather than a metered fare (though the meter always runs and you should then pay the lower of either fare). A minority of taxi drivers in Amsterdam have given the industry a bad name over the years. Clashes between rival firms have occasionally led to confrontations at taxi ranks. Problems for visitors have included drivers refusing to take passengers on short trips or overcharging on fares. The authorities have taken action to clean up the business – all drivers must be registered with an approved taxi organisation and all journeys are tracked by GPS. The most reliable taxi company in the city is probably TCA (tcataxi.nl) with 1,250 taxis and 1,500 drivers. Call them at +31(0)20 7777777 or use the TCA iPhone/Android app. Its taxis have red and black roof lights marked “TCA TAXI 7X7”. TCA also has VIP cars available (top of the range Mercedes, BMW and Audis) plus a few electric vehicles. All TCA drivers have passed exams and are entitled to drive on tram and bus lanes in Amsterdam. TCA taxis can accept credit and debit cards for payment (except Diners Club) and also has a special loyalty card scheme for payments. Other official taxi firms: Aemstel Taxi (+31(0)297 330033); My Taxi Centrale (+31(0)20 475 0320); Staxi (+31(0)20 705 8888); Taxi Direct Amsterdam (+31(0)20 633 3333); Taxistad (+31(0)20 208 0000). Taxi Electric (+31(0)88 100 4444) uses Nissan and Tesla electric cars and has competitive fixed prices from Schiphol to Amsterdam. The standard price is €40 to Amsterdam Centre, €30 to Amsterdam South/De Pijp. The Schiphol last minute fare is €30 to Amsterdam Centre (or 25% off to other districts) if you call from the airport and they have a car nearby. Cars have free WiFi on board and travel to other Dutch cities is possible. Uber, the international taxi app service (uber.com) is available for rides in Amsterdam. It comes as either UberBlack (original service with VIP taxi sedans), UberVan (larger minivans available) or uberX (lower cost version). Users can order a car through the phone app and payment is automatically handled.